There are two sides to every city; just as there are two sides to every relationship and every marriage. One moment you gaze in awe at the silhouetted Eiffel Tower against the hazy Paris skyline from the balcony of your luxury hotel suite and the next you find yourself on your backside in a pile of empty crates and bags of rubbish outside an overly-priced seafood restaurant.C’est la vie mes amis. Such is the case for Nick (Jim Broadbent) and Meg (Lindsay Duncan), a couple from Birmingham, who throughout Le Week-End alternate between celebrating and commiserating the fact that they have been married for thirty years. To describe Nick and Meg’s getaway to the most romantic city in the world as romantic would be a stretch – whether the couple are more in love with their surroundings than they are each other, or the memory of each other, is a point for debate. As their Eurostar pulls into the Gare du Nord they arrive to Par-ee with a lot more baggage than two wheelie-suitcases and a guidebook. Duncan is effortlessly classy, elegant, explosive and embittered as the long-suffering Meg. Broadbent’s Nick is battle-weary, down on his luck (after recently losing his job as a philosophy professor) and suffering from the kind of existential funk that would cause the Anchorman boys to go out and buy new suits. Nick is like Eeyore in a flat cap and fancy scarf and Meg an ageless, fedora’d beauty from a New Wave film – the old adage that opposites attract appears to have been lost on the pair as they return to the city that they visited as newlyweds three decades previously. This time around, though, it is make or break time for the dying embers of a life-long relationship. Meg uses their anniversary dinner to ask, “Once the kids have gone, what’s left of us?” Timing might not be her strong suit but sweeping it all under the carpet is no longer an option. The bickering and nastiness begins early on and doesn’t really let up at all but it is far from all doom and gloom. Interspersed between the cheap shots and real body blows there are moments of humour, tenderness and love that only two people who truly understand and care for one another could produce. This is testament to the calibre of the leading pair as well as the writing of Hanif Kureishi, who has collaborated with director Roger Michell on several previous projects. Nick listening to Bob Dylan with his headphones in, so as not to wake the napping Meg, whilst dancing around in his socks and half-singing/gurning whilst rocking out is but one example of many. 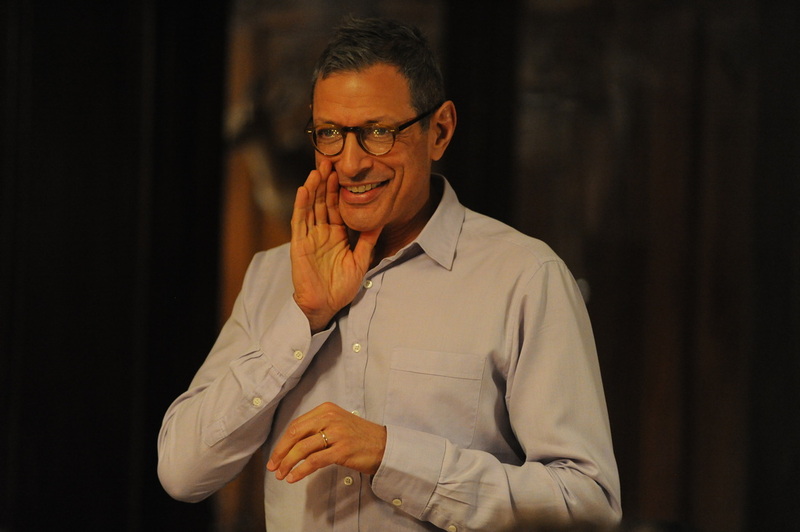 I can’t think of the last time I saw Jeff Goldblum on the big screen, but he is a revelation in Le Week-End as the extravagnant, successful but essentially bereft Morgan – internationally renowned financial/political journalist and Cambridge University contemporary of Nick. Although he has achieved the kind of limelight the latter can only dream of, he still idolises his humble English counterpart. A chance meeting between the old peers leads to a ritzy dinner party chez Morgan and some of the most frank and alarming toasts that you will ever hear. As our star-crossed (or just cross) lovers prepare for a night out, a black and white clip of two men and a woman dancing together (from Godard’s Bande à Part) to a lively jazz tune in a Parisian bistro distracts them and prompts some more awkward Dad-dancing from Nick and a wry smile from Meg. As Le Week-End draws to a close I couldn’t decide whether the film is an indictment of or a glowing endorsement for the great institution of marriage; however, I can say for sure that two people who find themselves sitting in a cafe without two Euros to rub together and decide to drink themselves silly and get up and dance in front of complete strangers must be doing something right. Posted in 2013 and tagged film, Jim Broadbent, Le Week-End, Lindsay Duncan, movie, Roger Michell.. Bookmark the permalink.